Drawing inspiration from his father’s innovative and revolutionary approach to classical Tabla solo, Nilan was determined from a young age to be proficient as a soloist. 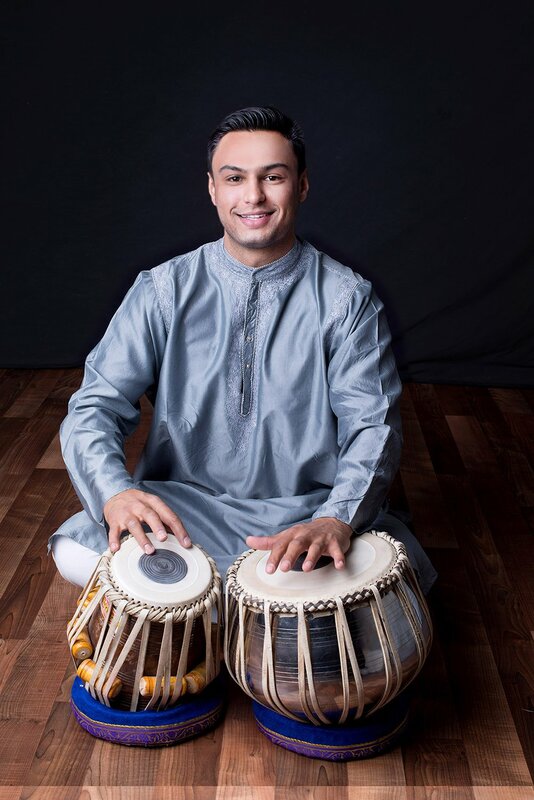 He presented his first public Tabla solo at the age of eleven, at the Ali Akbar College of Music in San Rafael in the presence of Maestro Ali Akbar Khan. Within months of his first recital, sensing his passion and devotion to the art form, Nilan was accepted as a ganda bandan disciple of Khansahib’s and underwent the sacred ceremony in which the Guru ties a thread around the disciple’s hand, initiating a life long bond and blessing. Over the course of the next decade, Nilan would go on to lead the AACM youth Tabla Ensemble, performing various arrangements of his father’s compositions in ensemble format throughout the United States and India. It was during these formative years that Nilan was introduced to the world of Tabla accompaniment by Maestro Ali Akbar Khan, providing rhythmic support for his vocal and instrumental classes at the College.